A bill in the state Legislature that would have given a state agency funds to buy 500 acres in Kalaeloa from the U.S. Navy is dead in the water, but community activists still believe they can revive the former military base. The state Hawaii Community Development Authority sought $250 million in bonds over a 20-year horizon to buy the lands to jump-start economic development there. Now it will have to seek those funds elsewhere. Proponents of the bill, which was also backed by Gov. Linda Lingle, want to see the master plan come to life, with up to 3 million square feet of light industrial, retail and commercial space, as well as 6,300 homes, a high-technology and alternative energy center, and new public schools. The U.S. Navy faces a Sept. 2008 Congressional deadline to transfer the lands. 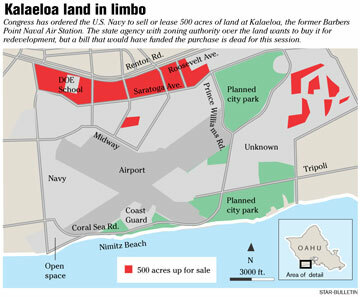 A bill that would have given a state agency funds to buy 500 acres from the U.S. Navy in Kalaeloa is dead for this legislative session, but efforts are still underway to transform the former base into a thriving community. WIth the bill, the Hawaii Community Development Authority sought the right to issue $250 million in bonds to purchase the lands. Proponents of the bill, backed by Gov. Linda Lingle, said their efforts to fund the purchase will now continue through the state budget. The U.S. Navy is under a congressional mandate to transfer the lands by Sept. 30, 2008. » Would have authorized HCDA to issue $250 million in bonds for the purchase of 500 acres of land at Kalaeloa. It crossed over to the Senate, but stalled in committee on March 8. "I think now is the right time," said HCDA's executive director Daniel Dinell. "It is time for boldness, and we'll continue to work at trying to make this happen." HCDA sought the $250 million over a 20-year horizon for the purchase of the lands. In contrast, Dinell said Kakaako received about $200 million for the redevelopment of Kakaako. To date, only 44 percent of the Navy lands have been transferred. Dinell said the agency is unaware of any other potential buyers for the lands. Proceeds from the sales are to fund Ford Island's redevelopment. The Navy did not respond to Star-Bulletin questions by press time. HCDA, which oversees development of Kakaako, also establishes land use rules for the Kalaeloa community development district. The rules would apply to everyone except for federal entities. A detailed master plan for Kalealoa completed in September 2005 outlines the agency's vision for 3 million square feet of light industrial, retail and office space. In addition, the plan calls for 6,350 residential units, a third of them falling under affordable-housing guidelines, along with new public schools, a Hawaiian culture center and parks. Its focus would be on high- technology and alternative-energy development. Dinell described it as a community targeting Generation Y, with housing as well as attractive jobs. Backers of the bill included the Hawaii Association of Realtors, the Kalaeloa Community Network, Haseko, Mikiko Corp., the Makakilo/Kapolei/ Honokai Hale neighborhood board, Waianae neighborhood board and a handful of nonprofit organizations. For now, though, the plan is still just a vision with no funds behind it. Sen. Russell Kokubun, (D, S. Hilo-Naalehu), said he did not schedule a hearing for the bill because he did not feel it presented a clear purchase price, nor comprehensive costs for infrastructure work. Besides, the timing was not right, he said, given the Navy's recent announcement it will not be home-porting an aircraft carrier in Hawaii. "I think Kalaeloa is kind of a blank canvas," said Kokubun. "Now the surrounding areas have been developed, and the proposed rail will go there, West Oahu University will go there ... (the state Department of Hawaiian Home Lands) is also developing lands there. I think there's great potential for it." Kokubun said the bill might have legs in the next legislative session. Proponents of the bill say the master plan is not affected by the news of the aircraft carrier USS Carl Vinson going to San Diego. "It doesn't change the master plan at all," said Dinell. "It creates a certainty over something that was not certain." He added: "The master plan is very flexible. We very much are open with working with the Navy on future needs of Kalaeloa, both the airport and the land. Although the aircraft carrier decision has been made, there are other military decisions and needs. Kalealoa could play a part in helping that." Sen. Mike Gabbard (R, Kalaeloa-Makakilo), a proponent of the bill, said knowing there will be no aircraft carrier is good news. "That was a very positive thing, so we can move forward," said Gabbard. "The bottom line is, we have to be careful these lands don't just go to the highest bidder." Currently, Kalaeloa is home to an elementary school, an airport, two homeless shelters, and rental housingm as well as the U.S. Coast Guard and state National Guard. Many of the former Navy base buildings sit empty, subject to vandalism, while area fields lie fallow. City bus lines do not run out to Kalaeloa, and the plumbing and utilities are falling apart. Ann Bouslog, president of real estate development consulting firm Mikiko Corp., said Kalaeloa is potentially the economic anchor for the second city. But without infrastructure, the land has little value. Maeda Timson, HCDA board member, said the aircraft carrier decision did not matter to her. "Whether we had it or not, we're flexible," she said. "The [bill] would have given us the chance to revitalize development in Kalaeloa and spur interest from other entities. It's disappointing, but it's not to the point that we're going to give up." Timson supports a new raceway park, as well as high-technology development and affordable housing at Kalealoa. » State Sen. Mike Gabbard was incorrectly called a representative in a photo caption on Page C3 of yesterday's morning edition.